Selecting the best modular office furniture solution does not have to be a daunting task. Introducing the Mayline CSII steel office furniture. Now there is no need to agonize over style, function, versatility or price. Building on a design using rugged all-steel desk construction, this Mayline CSII modular office furniture line boasts sleek functionality and a stylish new look, all in a package that registers high on the affordability scale. Now you can truly and creatively fine-tune your modular office furniture to fit the personality of your office, from comfortable neutrals to bright, energizing colors. And everything in between. Choose from our head-turning array of corporate fabrics, paints and laminates or - at no additional upcharge - access to over 400 Wilsonart and Nevamar laminates and many select fabric lines from Guilford of Maine including Terratex. 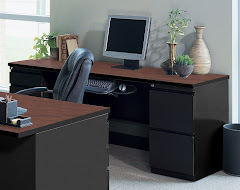 The Mayline CSII discount office furniture - Durable all steel desks at exceptional prices. From mobile computer workstations to executive desks, and meeting tables, The Mayline Group's focus has always been on innovative office furniture. With stylish designs to complement any decor, Mayline and Tiffany Industries feature durable steel office furniture at exceptional prices. 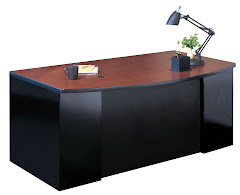 The Mayline CSII discount office furniture - Durable all steel desks at exceptional prices. From mobile computer workstations to executive desks, and meeting tables, The Mayline Group's focus has always been on innovative office furniture. With stylish designs to complement any decor, Mayline and Tiffany Industries feature durable steel office furniture at exceptional prices.dustries feature durable products at exceptional prices. Mayline CSII Office Furniture - Bridge - Height-Adjustable - 36" x 24"
The Straight Bridge is not freestanding and requires support from adjoining worksurfaces. It is available with full, 2/3 height, or no modesty panel. One grommet in surface, standard. 24" Deep Credenza has a 2/3 height modesty panel included. Pedestals and legs are non-handed to allow installation on either left or right. Two grommets in surface, standard. F/F and/or B/B/F available. 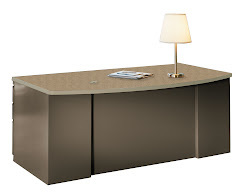 39" Deep Bow Front Desk has a pedestal depth of 30". The Flush Modesty has a 9" overhang and the Recessed Modesty has a 10 1/4" overhang. Full height modesty panel included. Two grommets in surface, standard. Desks 29" Height; Depths of 24", 30", 36" or 39" Bowfront; Widths of 48", 54", 60", 66" and 72". Corners 29" Height; Depths of 24" and 30"; Widths of 42" and 48". Returns 29" Height; Depths of 24" and 30"; Widths of 42", 48", 54", 60", 66" and 72". Bridges 29" Height; Depth of 24" in Straight and Contoured front edge; Widths of 36", 42" and 48". "J" Tables 29" Height; 72" Wide; 48" Depth; Return depths of 24" and 30". "P" Tables 29" Height; 72" Wide; 48" Depth; Return depths of 24" and 30". With Conference or Standard Peninsula End. Team Table 29" Height; 25" and 31" Depths; Widths of 48" and 60". Desk bases constructed of cold rolled steel. Structural components are made from 16 Ga. with exterior surfaces made from 18 or 22 Ga. steel. 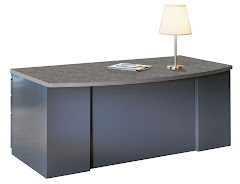 All desks, credenzas, returns, and "P" tables are available with storage pedestals incorporated into table base to reduce redundant components. All desks, credenzas, and returns are non-handed. Modesty panels full height on all desks, except credenzas and ÍJÍ tables which offer 2/3 height modesty panels. Bridges offer three modesty panel options: full height, 2/3 height, or no modesty panel. 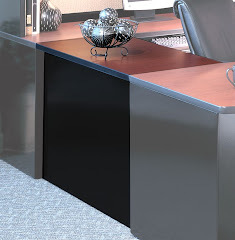 All desks come with standard leveling glides and grommets. Legs and Modesty panels are made from Cold Rolled Steel. Structural leg components are manufactured with 14 and 18 gauge CRS; modesty panels manufactured with 22 gauge CRS. Worksurfaces High Pressure Laminate face with PVC edging covered on bottom with backer sheet to prevent warping; core is 1 1/8" thick 45-lb. density particleboard. Worksurfaces support optional under-counter keyboard storage. Worksurfaces have standard wire management grommets and are provided with cable routing clamps, which are to be field installed. Nominal Dimensions: Height 28" _ Width 14.8" _ Depth 23" and 29.3". Cabinets are of a welded shell for maximum structural integrity. Pedestals are non-handed and can be attached to desks, returns, and "J" tables in place of legs. Pedestals feature full extension ball bearing slides on all drawers, with adjustable leveling glides, pencil tray and box/file divider. Locks are standard and allow for the lock cores to be changed to key entire suites alike. All drawers units are equipped with an integral locking device to prevent more than one drawer from being opened at one time. Nominal Dimensions: Height of 36"; Depth of 15"; Widths of 48", 54", 60", 66" and 72". Shelf depth is 13 7/8". 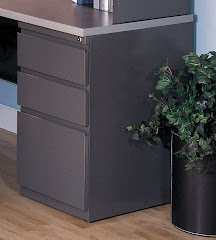 Worksurface to bottom of shelf clearance is 20"H.
Cabinet body and Door are constructed of Cold Rolled Steel. Structural components are of 18 Ga. with exterior surfaces made from 22 Ga. steel. Door shall swing up and over the body to optimize interior space using ball bearing slides. Soft close assist, tack panel, and task light options available. Lateral files available in 2, 3, 4 & 5 drawer configurations with 36" and 42" widths. Welded cabinet body is heavy gauge steel construction with components ranging from 14 to 20 gauge. Four leveling glides provide 1.5" of adjustment. Integrated drawer pull in each drawer front. All drawers and shelves use a heavy duty, three part telescoping, ball bearing slide. Top drawer of 5 drawer lateral file is a roll-out shelf. Accommodates Letter, Legal and A4 paper sizes. Letter 47.25" LFI (If filed front to back via 3 rows otherwise same as legal and A4. All cabinets are keyed alike standard. Core removable lock allows for keying cabinet uniquely. Lock mechanism secures both sides of drawer. Counterweight included to meet ANSI/BIFMA requirements. Two hang rails provided per drawer for side to side filing. Mechanical interlock inhibits the extension of more than one drawer at a time. Bookcases are available in 2, 3, 4 & 5 shelf heights, all 36" wide. Cabinet body consists of sides, top, back and bottom. Gauge of steel is 21 & 22 Ga. C.R.S. Adjustable shelves made from 21 gauge steel with a 22 gauge steel reinforcement channel welded to the bottom. Leveling glides provide 7/8" of adjustment. Useable shelf dimensions 35.81" x 13.19". Each shelf (except for bottom) is adjustable in 1" increments. Each shelf has a load capacity of 150 lbs. with minimal deflection. Nominal Dimensions: Heights of 9" and 18" can be stacked to create panels of 18", 27Í and 36" H.
Widths of 24", 30", 33", 36", 42", and 48". Depth of 1 1/4". Privacy panels are field installed and secured directly to the top and side of the worksurface for maximum stability and vertical rigidity. Finishing kits are available for ganging panels together to create custom combinations. Finishing kits consists of PVC (trim strips and ABS trim caps. Skins are Micore 300, which are 50% lighter than particleboard. Consists of inorganic mineral fibers that resist moisture, minimizing expansion and warpage. Core is 0.375" Kraft Honeycomb, 1/2" cell, phenolic impregnated, 2.76 pounds per cubic foot density, made of recycled paper. All Mayline corporate fabrics are 100% Recycled Polyester and meet or exceed Flammability - ASTM E-84- Class 1 or A. For additional information please see individual fabric specs below.